It’s been a long-long time since I’ve written a candle review. Yeah, I know… my bad! I’ve been working on so many behind the scenes projects for Candlefind that I just haven’t had time. Thankfully, I’ve been able to leave reviewing in the efficient (and capable) hands of my wonderful reviewers… which has now grown to 6 incredibly talented gals named Andrea, Julia, Avery, Lisa, Jen and now Deirdre. I am so amazingly blessed to have such incredible women write for this site. And speaking of wonderful… Jen left us for awhile two years ago so she could dedicate and center on expanding her family but she’ll be back and raring to go this year with a few new reviews coming your way. I’m SO excited to have her back and reviewing again!! So, what has personally brought *me* out of hibernation? What else? Candles man! Candles!! You know you’ve got it bad when you can’t even go to the grocery store without eyeballing the candles they have on display. I’m in mine at least twice a week and I probably know every candle they carry, in every scent and on what shelf they sit on. Not even probably, I *do* and every time I walk past those little beauties, I scan. Normally, I see Village Candles, some Partylite, no namers… yada yada. What I saw recently had me do a double take. – Third shelf down on the right (primo eye level spot) were 5 Harry & David candles!! HARRY & DAVID! Now, probably not everyone reading this knows who they are but you will after this! Harry & David only sell THE most delectable pears on the planet! 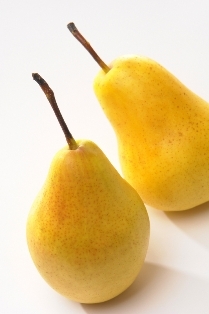 These pears are sooooooo incredibly delicious and are worth their weight in gold (I think they may even cost as much). So, if you get anything Harry & David for Christmas or for any occasion at all… well… quite frankly… you’re special. Mighty special! So when I saw these little guys, I had to sniff every one of em. The five scents to choose from were – Baked Lemon Bars, Vanilla Galette, Royal Riviera Pear, Oregold Peach, and Blueberry Muffin. At 15 bucks a pop, I chose three to review… Baked Lemon Bars, Vanilla Galette and Royal Riviera Pear… the three scents that my nose and the sensory part of my brain gravitated towards. I may nab the others later to review if these prove worthy. They certainly are gorgeous looking candles… nothing less than I would expect from anything Harry & David. What do my Harry & David candles look like? 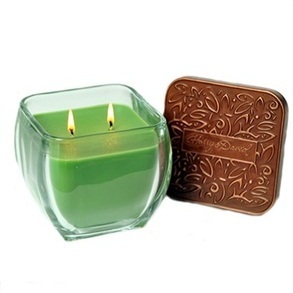 These candles are 16 ounce square (double wicked) glass candles with rustic copper lids. “Harry & David” is embossed in the center of the lids. Each candle has a clear label on the face of one side with a picture that matches the scent and the Harry & David logo at the top. Very nice and simply stated.I didn’t see these exact candle styles online anywhere so I have a feeling this style is available only in stores that sell this brand. But, other styles are available online in all these fragrances. Not the best description in the world but that’s okay…. I got to smell it in person and that’s all I needed. For those internet shopping though, that description helps in no way whatsoever. So, I’ll do my best to describe it for you. 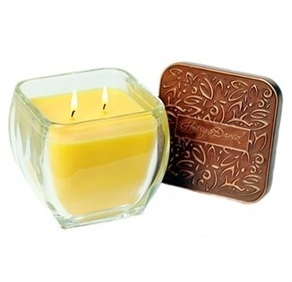 Harry & David’s Baked Lemon Bars was the first candle I grabbed, I saw yellow and I was salivating… when I smelled it… it was loooooooooove!! 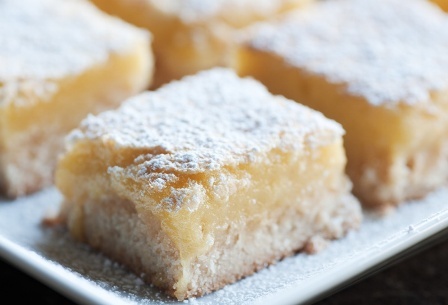 It smelled like a sweet and creamy lemon custard… I was sold and in my cart it went! These candles are 16 ounces so whenever reviewing this size or bigger, I like to start in a larger room just to see how it holds up. I did get a full melt pool within an hour of lighting it (which is nice) but the throw was pretty light. When you love a fragrance, no sense wasting it so I moved the candle to a smaller room where it performed much better. This fragrance was an utter delight! It smelled as good lit as it did cold. With the right scent throw, my entire large bathroom was filled with the perfect lemon bakery scent… it smelled like a rich and moist cake with the perfect dollop of sweet lemon cream swirled throughout. The scent throw was subtle and that would be my one and only complaint. I would have preferred knock your socks off strong. Even so, I’d buy it again… in a heartbeat. This candle also burned like a dream! Never had to trim my wicks, perfect melt pool each time and it burned all the way to the very end, no residue wax left on the sides of the glass. A++ on the burn performance. Smelling this candle before lighting it was just average. I didn’t smell it and moan or get excited. But, I fired up the wicks and let it ferment in my bathroom awhile. When I came back to take a whiff, I was greeted to a quite pleasant pear scent. Not anything I could describe, just a sweet and smooth pear aroma. I liked it quite a bit. Most pears I’ve tried either smell synthetic, super tart or smell like candy… none have ever really impressed me. This one smelled like a true pear but with a little extra “something” I can’t quite describe. As their description proclaims, this is a mellow scent. When I walked into the room, I wasn’t blasted with a strong aroma, just a subtle fragrance. It was nice and a great choice for a smaller room. Also wanted to add, this candle didn’t burn as well as the Baked Lemon Bar candle. The wicks initially struggled and it took about the third burn to get a steady melt pool so it did tunnel a bit. I’m hoping this was a fluke since my other one burned so well. I’ll find out because I would definitely buy this scent/candle again. Sweet vanilla? Home baked cookies? What more could a vanilla lover ask for?I’m pretty picky when it comes to my vanillas… I know what I like and I know what I don’t. There are so many variations of vanilla out there – it’s not even funny – so it’s really all just personal preference. The hard part is wading through them all. My taste runs toward the sweet and creamy blends… the velvety vanilla’s you can practically taste on your tongue when you smell it or the dense vanilla’s you want to wrap yourself in like a warm blanket. Mmmmmmm!!!!! Bakery lovers… you know the kind I’m talking about!! With that said, I loved this candle! Loved it from beginning to end. 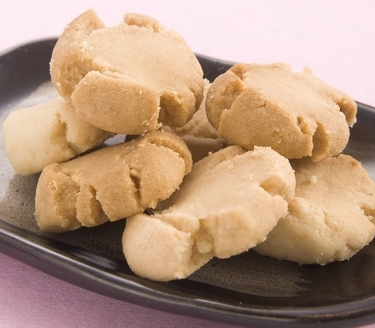 The description is dead on… a smooth and rich vanilla cookie all the way. I think I even smelled a touch of almond in the mix… just a pinch… too much almond and it dominates the whole scent but with this one – you almost questioned if it was there. This candle burned like a dream. Never had to trim my wicks, complete melt pool with each burn and it burned all the way to the bottom with no residue wax on the glass. It burned perfect. The strength of the scent on a scale of 1 to 10, I would give it a 5. It wasn’t super strong but burning it in a smaller room did improve the strength. Would I buy this scent again? Absolutely!! How did my Harry & David candles burn? All in all, these candles burned pretty good. Royal Riviera Pear struggled but I’m guessing I purchased a dud since the other two burned perfectly. Very little maintenance was required with these candles. Loved em! I scored big time with these candles and only had to go as far as my local Safeway. Now that’s a find!! I searched the net and it looks like a select few scents can be purchased directly from Harry & David’s site but they’re pretty pricy. I also found another site called Quilted Classics that sells a nice variety as well. But if I were you and you’re itchin to find these candles, I would start scoping some local stores near you… if they have them in my remote little town, then the odds are pretty high in your favor that you’ll find them closer to home as well. The price-tag for my candles were $15.95 but I paid 11.95 on sale… that’s a pretty sweet deal. If you can’t find anything locally or just perfer the convenience of online shopping, then Quilted Classics looks like the site to buy from… they have a nice variety of styles and scents. Harry & David offer some pretty incredible gifts and I can now add candles to that. 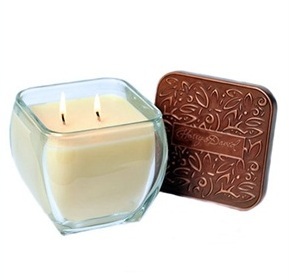 These are very gift-able candles, very well presented and the quality was excellent. They were well worth the price I paid and then some. I’ll buy again and again for sure. Dillard’s also sells a few fragrances. Have you tried Harry & David candles? Review them with us. It’s simply… write your review and star rate your experience in the comment section below.